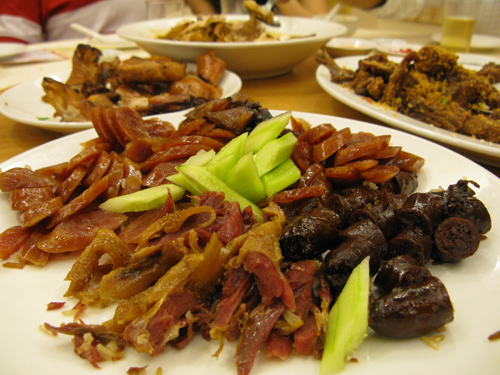 I can’t remember the last time my stomach was subject to a Restoran-Oversea-style 8 course Banquet meal. I think my stomach has actually shrunken over the years I’ve been in London… probably a side effect of too many poncey European 3 course meals. But with so many Imperial College alumni back in K.L for Chinese New Year, it was the perfect excuse to get together and stuff ourselves with a nice big Chinese meal. We also had the all important matter of settling the global debate around which char siu rules them all. To make doubly sure that we would get food and special treatment aplenty, M and N managed to persuade E to book a private room in his dad’s name with the usual Dato’s set menu (…although E had to sit this one out on the day with severe gastiritis, J.R had the waiting staff on a string and did a damn fine job of playing Dato’ Jr in his stead). 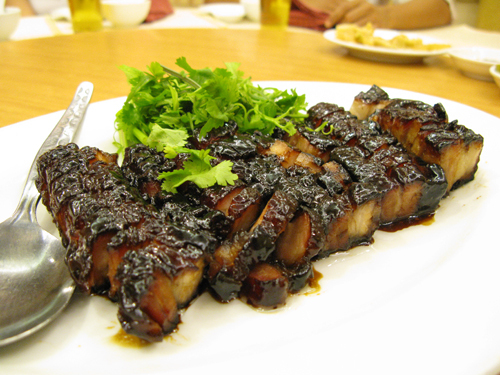 ..the World’s best Char Siu? After all the Char Siu banter on Facebook, it would have been a crime to kickstart with anything else. It was Char Siu as it should be – a belly pork cut to stop the heart that was roughly 60% fat, 40% meat. Absolutely melt-in-the-mouth tender and a heavenly sweet glaze to accompany. Only complaint was that a few of the fringe pieces were a bit over-charred, rallying the carcinogens in my body a little too raucously than I would have liked. Next up, Shark’s fin Soup. I thought it’s consistency was good (not overly starchy as it sometimes is) and with a small glug of black vinegar, the flavours bound very well indeed. 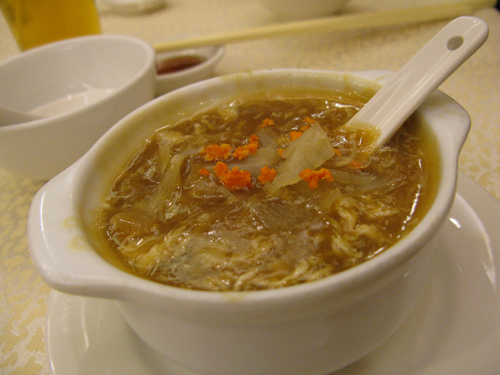 However, there was probably more crab-meat in the body of the soup than shark’s fin itself. If you’re going to call a soup by its name sake, its a real crime to let another ingredient hog the lime-light. The Oxtail Stew which followed suit was completely on the money. 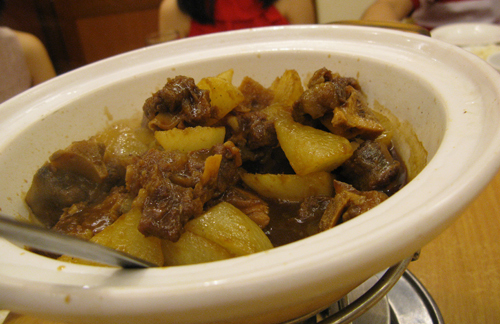 Slow-braised in a claypot with white radish, it was an explosion of beefy flavour… the meat super tender and just about falling off the bone. 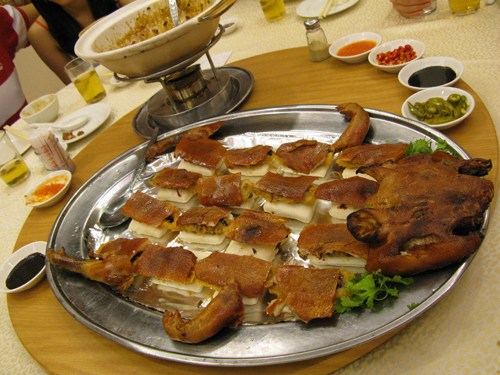 Then came the piece de resistance of any Chinese New Year reunion dinner – the infamous Suckling Pig which the Oversea’s institution is built on. My oh my, just look at the beauty. The skin was as crisp as crackling gets. The thin layer of rich, fatty, savoury meat was complemented perfectly by the sweetness of the plum sauce and white bun it was perched on. 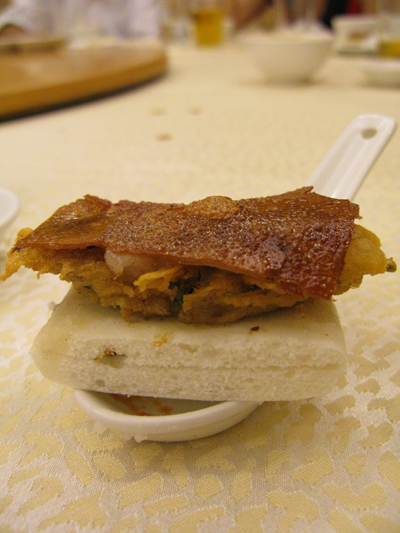 Sandwiched in the middle between the bun and pork was a deep fried fritter of dried shrimp, garlic, scallions and chives. MmmHmmMMm =P. … a Close-up shot of what was soon to become my third helping. By the time I had finished my third helping of Suckling Pig, my stomach was already starting to creep up against capacity. The next series of dishes that followed, though all ok, were nothing to shout about really (its a good thing they weren’t as good as the Suckling Pig or I would have continued to gorge myself to the point of no return). The ribs and remnants of the Suckling Pig were deepfried in salt, pepper and garlic. Though packed full of flavour, they were a little on the dry side given all the fat content was on the skin of the earlier dish. Herbal Chicken and Braised Tofu were wholesome and hearty but a little under-dressed for the occasion… more comfort grub than prosperous celebratory cuisine. What is worth a mention however was the final main dish of the evening . 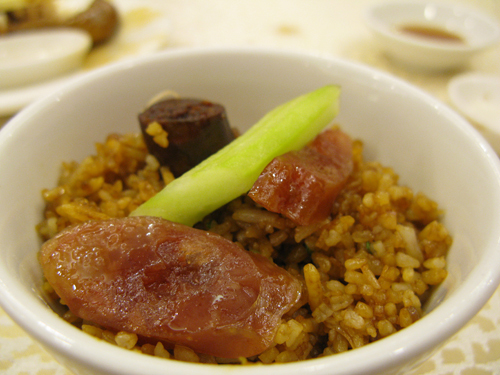 It must have been more than 5 years since I last had Lap Mei Fun – a Claypot Rice and lap cheong (chinese sausage) speciality. I expected to be too stuffed to really enjoy the carbo and heaviness of it all, but the rice was surprisingly fragrant and light… perfect with the genourous helpings of Chinese Sausages ranging from the traditional chewy-sweet lap-cheong type, to the dark-coloured, rich black-pudding variety. Off to Ipoh tomorrow for a couple days. ‘mr gan’, moe yee see ah. lei ker saang gwoh lei kan.
by the way thanks guys for waiting up to say bye..
Oh, I had no idea you were also an IC grad! Su – lin – you too? When did you graduate? Finished Bioengineering in ’07.